We’re huge fans of utility and practical cycling here at Velophile HQ. Some may be surprised to find out, but converting the humble bicycle into a versatile workhorse that is capable of carrying a week’s worth of groceries really isn’t too expensive or difficult. Of course, there are also more exotic ways to carry loads and/or multiple people, such as cargo bikes, trikes, long wheel base bikes, and trailers. In the interest of helping people reduce their dependence on money and oil burning private automobiles, we have compiled a brief guide to carrying loads when commuting, shopping, or for recreational use. This is the preferred method for cycle commuters and daily riders to carry light to medium loads. Karl has used the Tubus racks and Ortlieb pannier bags for the past four years and they are still going strong. Despite the higher upfront cost, it’s well worth considering the higher quality models such as the stainless steel Tubus Cosmo/Nova lowrider racks combined with the 20L and 12.5L variants of the Ortlieb Front/Back Roller Plus pannier bags. These models are generally more versatile, functional and durable than cheaper brands, ensuring many years of reliable use. Bicycle trailers are quite uncommon, however they offer many benefits and versatility. Single wheel trailers, such as the popular B.O.B (pictured above), are a favourite for self-supported, long-distance cycle tourers and people needed to carry large, bulky objects. The dual-wheel enclosed style trailers for carrying a child are also a favourite for utility cyclists carrying weekly groceries. 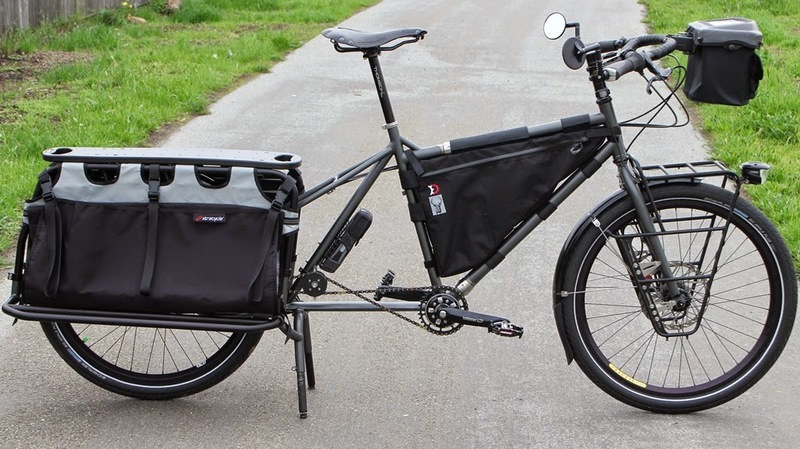 Adding pedelec/electric assist to either the pilot bicycle or trailer is increasingly popular to help overcome hills, headwinds, poor weather and longer distances while loaded. The ultimate pedal-powered cargo carrying solution. Cargo bicycles/tricycles (bikes), in all their varieties, are rare in car-dominated countries, but quite popular in The Netherlands and Denmark for obvious practical reasons. As mentioned in the pro column above, there are multiple cargo bike designs and options to suit various requirements and essentially provide a feasible alternative to a car for short to medium length trips (2km to 15km). Cargo bicycles are ideal for people living in bike friendly areas who want to go car-free or replace their second car, as they are perfect for ferrying children around, buying large amounts of groceries, and so on. Long wheel base cargo bicycles are also an excellent option for carrying large and heavy loads, but do not have the cargo ‘bucket’ at the front. Like the bike trailers, recent improvements to pedelec / electric assist design and price has removed many of the barriers of these bikes caused by the inherent weight and bulk, and have made cargo bikes more accessible and practical for normal people doing normal everyday tasks – even if they live in areas with hills or unpleasant weather. Looking for a cargo bike in Australia? Try CargoBike, CargoCycles or Dutch Cargo Bike. We haven’t dealt directly and aren’t affiliated with these companies in any way, but a quick online search showed these to be the most popular suppliers for cargo bikes. Worth a look. Please send us an email or leave a comment with your experience if you do try them out, as we plan to post more cargo-bike articles in the future. What’s your favourite option for carrying cargo on a pedal powered vehicle? Share your experiences and advice in the comments below.